Before you read any further, know that I understand trifles are supposed to fill the bowl…but I am not into making 9 million pounds of cake that no one will eat. 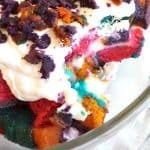 Because I was afraid that this recipe for Gluten-Free & Vegan Rainbow Trifle would turn out horrible. I was so horribly wrong. Horribly. We were licking the bowl clean. Now, I’m afraid to make more, because we’ll eat it all. Every. Last. Bite. So, if you want it to fill the bowl, you need to make 3 times this recipe. No kidding–3 times. But for me and my kids to eat that…we’re not going to do that to ourselves yet. Let’s let this last batch digest first. Heh. 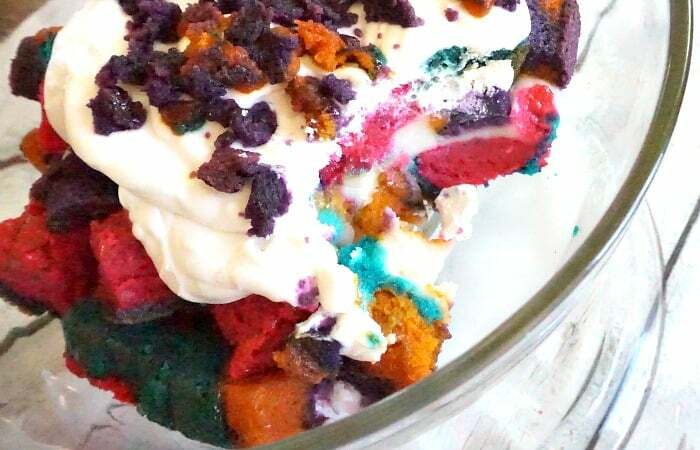 So, the trifle recipe that inspired me: The Kitchen Magpie’s Rainbow Cake Trifle. She’s got a great step-by-step for making the rainbow layers. But I totally did it in a single rectangle baking dish instead of two round ones. I still got very pretty rainbows throughout. But she’s got a great tutorial, so I would head over there if I were you. LOL! And what brought it all together? The vegan pudding that I am now IN LOVE with: Texanerin’s Vegan Pudding. Easy, yummy and totally my next obsession. Be on the lookout for all sorts of pudding-licious desserts now…LOL! 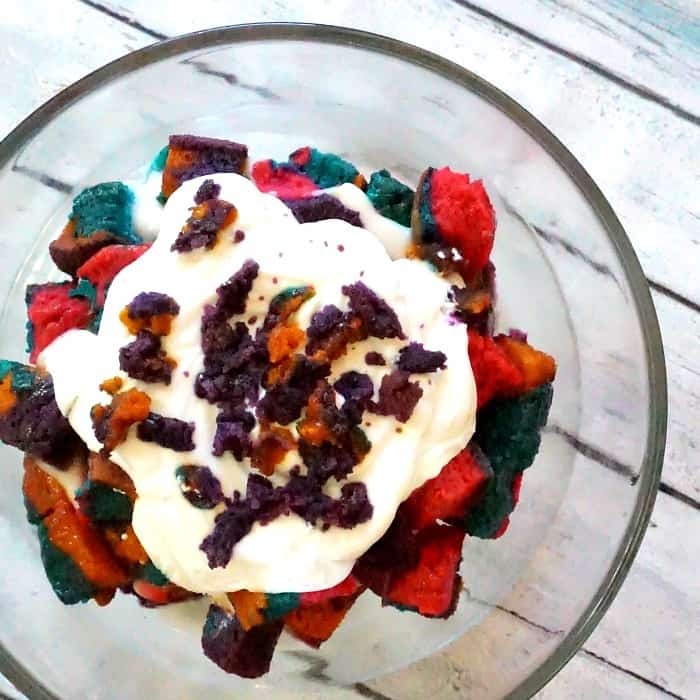 I was afraid that this recipe for Gluten-Free & Vegan Rainbow Trifle would turn out horrible. I was so horribly wrong. Horribly. Grease a square or rectangular baking pan with oil. Set aside. To make the cake, mix the dry ingredients in a medium mixing bowl. Combine the wet ingredients in a second medium mixing bowl, except the food coloring. Add wet to dry in 1/3 increments, stirring thoroughly. Divide batter evenly into 4 smaller bowls. Add one food coloring to each of the 4 smaller bowls. Mix each thoroughly, using a clean spoon for each. Pour the purple batter into the greased pan and gently spread. Pour the magenta batter into the greased pan on top of the purple, in the center. Gently rock the pan back and forth to spread the magenta batter. Pour the teal batter into the greased pan on top of the magenta, in the center. Gently rock the pan back and forth to spread the teal batter. Pour the orange batter into the greased pan on top of the teal, in the center. Gently rock the pan back and forth to spread the yellow batter. Place the cake in the oven and bake for 40-55 minutes or until a toothpick comes out clean from the center. Remove the cake from the pan and allow to cool completely on a wire rack. Set aside. While that's cooling, make your pudding by placing 3/4 of the coconut milk into a sauce pan over medium heat. Mix the remaining 1/4 of the coconut milk with the cornstarch and stir until mixed completely. Remove from the pan (carefully--its hot!) and place in a cool bowl. Set aside. While that is cooling, make your whipped cream by scooping out the cream from the cans of coconut milk. Add the powdered sugar to the cream and whip until soft peaks form. Set aside. As soon as the pudding is cool enough to handle, you can assemble your trifle! Slice the cake in 1-inch wide strips width-wise and down the middle lengthwise. Place chunks of cake in your bowl, then the pudding, then cake, then the whipped cream. Refrigerate for 2 hours at a minimum, although overnight is...well, it's AWESOME. Love it? Hate it? 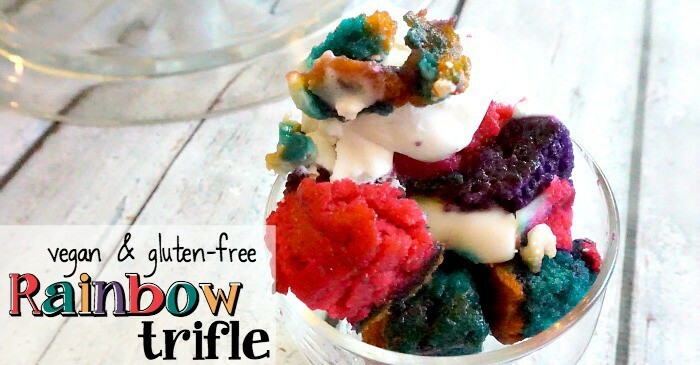 Wanna marry it and have Gluten-Free & Vegan Rainbow Trifle babies with it? Lemme know! LOL!